The staging host will form the base of your operation for creating your cluster. The primary role of the staging host is to hold the Tungsten Clustering™ software, and to install, transfer, and initiate the Tungsten Clustering™ service on each of the nodes within the cluster. 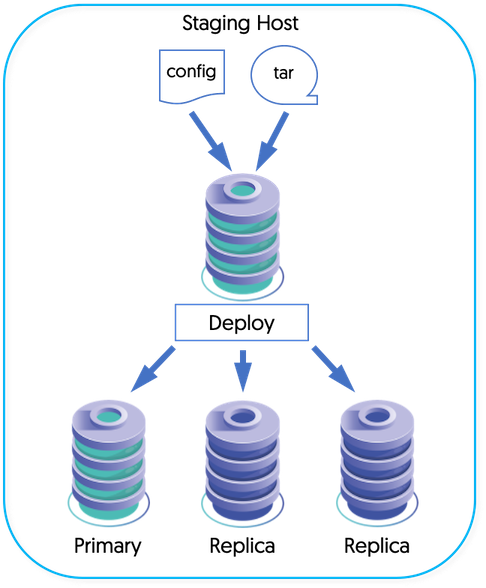 The staging host can be a separate machine, or a machine that will be part of the cluster. The recommended way to use Tungsten Clustering™ is to configure SSH on each machine within the cluster and allow the tpm tool to connect and perform the necessary installation and setup operations to create your cluster environment, as shown in Figure B.1, “Tungsten Deployment”.